Here in the West we've always been a bit behind our Eastern pals when it comes to Yo-Kai Watch releases. 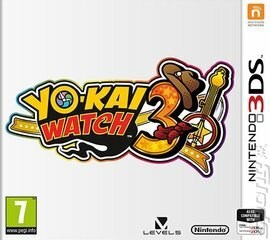 It's perhaps fitting, however, that because we've had a to wait a painstaking two and a half years for Yo-Kai Watch 3 to come out over here this swan-song for the series on the 3DS is coming at the end of the handheld's lifespan. This release bundles up the Tempura, Sushi and Sukiyaki editions released in Japan, so every last yo-kai is packed together in one box. 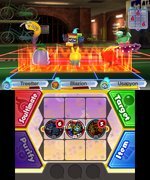 Said yo-kai are spirits that lurk just about everywhere and it's up to you to... well, we can't really say 'catch 'em all', but let's just say that the game works in a way that's very similar to another popular monster catching game on Nintendo platforms. For the first time, this third instalment in the series offers up a second hero in the form of Hailey Anne, meaning we get two separate parallel stories to play through. As in previous games, you roam the world (which is bigger than ever) looking for yo-kai to capture and level up before setting them off in automated battles. Combat's had a bit of an overhaul, mind you. Now there's a Tactics Medal Board on the bottom screen. You use this to line up your yo-kai. Put two complementary yo-kai next to each other and they'll buff each other's stats and form a stronger team as a result. Put one in front of the other and the front one will shield the back one from attacks. It's a system that makes combat more involved and has a significant impact on how battles play out. All in all, Yo-Kai Watch 3 is a fine send-off for the 3DS. 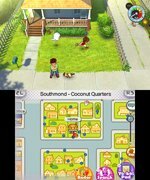 Roll on Yo-Kai Watch 4 on the Switch!